Katie Kirkpatrick has been writing nutrition articles since 2005. As a registered dietitian, her work has appeared in the "Massachusetts Dietetic Association Newsletter." Kirkpatrick holds a Bachelor of Science in dietetics from Miami University and a Master of Science in nutrition from Boston University. Mercury is a metal found in the environment, including in the water, air and soil. You can be exposed to mercury by breathing the vapors, through skin contact or by eating foods contaminated with mercury. Because the nervous system is highly sensitive to mercury, large amounts of mercury can damage the brain and kidneys. If you are pregnant, mercury can affect the developing fetus. The most common form of mercury is methylmercury, which fish absorb through the water and feeding, causing it to build up in their tissues. Large predator fish such as shark have a high level of mercury because they feed on fish that also ingest mercury. Almost all fish and shellfish contain some mercury; however, swordfish have a high level of mercury. These fish reach the FDA limit for human consumption of 1 part per million. The FDA and the EPA recommend that young children, women who are pregnant or nursing, or who may become pregnant, avoid eating these fish. The popularity of fish is increasing due to its reputation as an excellent source of omega-3 fatty acids, and its low-fat and high-protein nutrition profile. However, certain people should avoid fish like king mackerel because of its high level of mercury. Found along the Atlantic Coast and in the Gulf of Mexico, tilefish also have high levels of mercury. Cooking does not decrease the mercury content in fish, including tilefish, considerably. High fructose corn syrup (HFCS) is a common additive used to enhance the shelf life of foods. Numerous processed foods such as jelly, bread, barbecue sauce and flavored milk are made with HFCS. A January 2009 article in "Environmental Health" investigated whether mercury ended up in the final product, as the manufacturing process of HFCS includes mercury cell chlor-alkali products. Varying levels of mercury were detected in nine of 20 samples of HFCS. The accumulative effect of mercury ingestion due to the large amounts of products with HFCS that Americans consume is a major health concern. Is the Sockeye Salmon a Safe Fish to Eat? 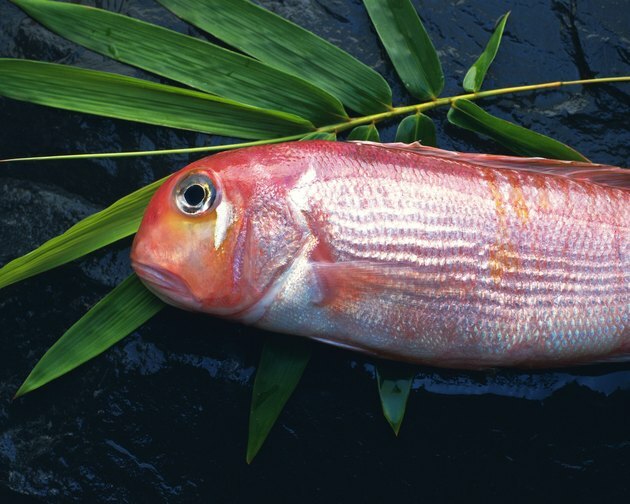 Is It OK to Eat Perch While Pregnant?